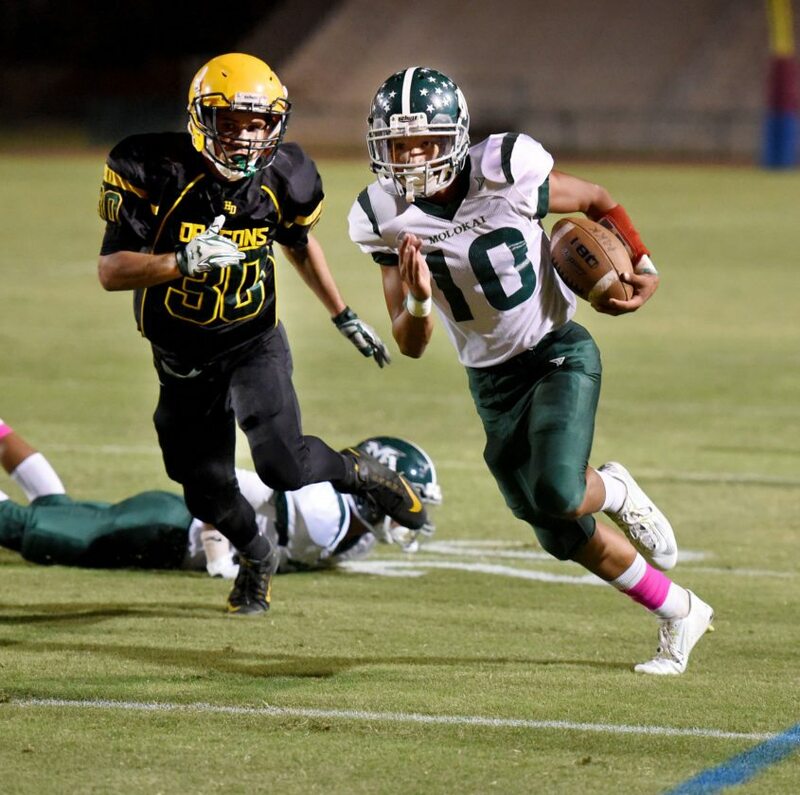 Molokai's Kaimana Nakayama returns a first-quarter fumble against Hana Thursday. 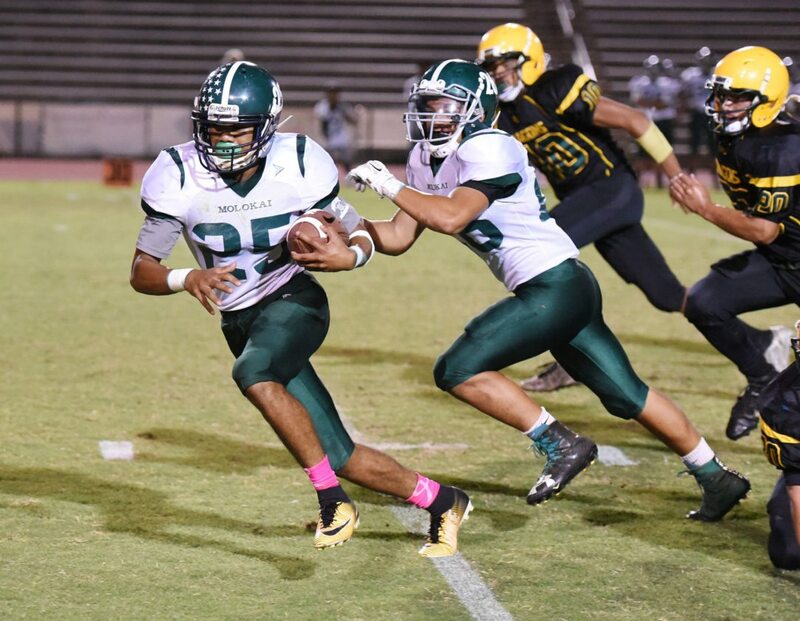 WAILUKU — The Molokai High School eight-player football team will host the Maui Interscholastic League championship game for the first time. The two-time defending champion Farmers finished a dominant run through the MIL regular season with a 48-6 win over Hana on Thursday night at War Memorial Stadium. Molokai (3-0) has outscored Seabury Hall, Lanai and Hana 155-70. 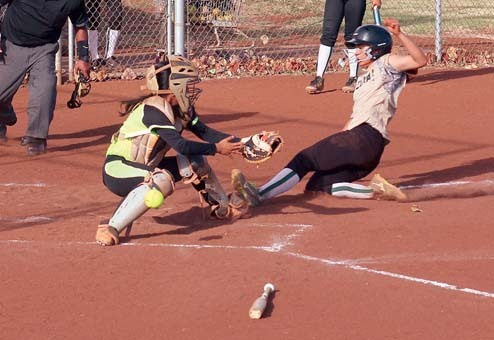 Molokai, which has won its last 14 MIL games, will meet Lanai for the league crown on Sept. 30 at the Farmers’ on-campus field in Hoolehua. After stopping the Dragons (0-3) on downs on the first drive of the game, the Farmers needed just one play to score. Shraedon Naeole-Starkey hit Nalima Puaa-Aki on a 4-yard scoring pass with 9 minutes, 33 seconds left in the first quarter. Molokai pushed the lead to 8-0 when a Hana punt snap sailed out of the end zone with 6:02 left in the first quarter. The Farmers needed just three plays to score after the free kick that followed the safety. 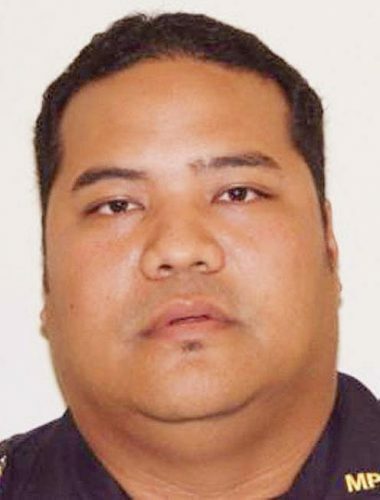 Hauoli Caparida ran up the middle 12 yards for the touchdown. Kolee Pedro-Tabilangan scored on a 1-yard run on the first play of the second quarter, and Pedro-Tabilangan scored on a 9-yard run two minutes later to make it 34-0. Puali Kalua broke free around the left side on a 35-yard TD run with 7:11 left in the second quarter to give the Farmers a 41-0 lead at halftime. 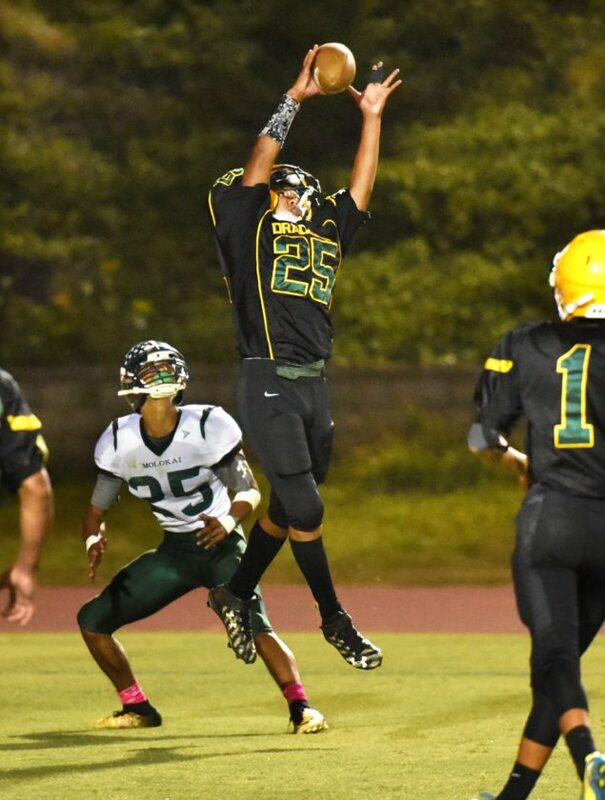 Kamaki Manangan caught a 34-yard scoring pass from Kaimana Nakayama late in third quarter for Molokai’s final touchdown. Hana scored on a 30-yard fumble return by Waihui Park with three minutes to play. The Dragons dressed 13 players for the game, while the Farmers had 34.